Lana Kennedy protests address problems at the county commission. PULASKI COUNTY, Mo. 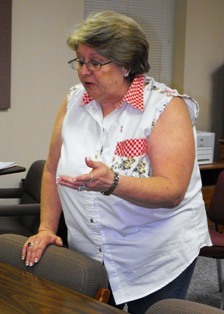 (April 26, 2010) — Following months of nonanswers from various government officials, Dixon resident Lana Kennedy came to Monday morning’s county commission meeting to protest the insistence of her neighbors on putting an address on their home that doesn’t belong to them. Kennedy came to the county commission and reported that her husband, who suffers from numerous medical problems, was taken to the intensive care unit by an ambulance that had trouble finding her home because of addressing problems; previous issues have included medical supplies delivered by parcel companies whose drivers couldn’t locate her residence. “I am stunned that this has gone on as long as it has, and that nobody has died as a result of this problem. My husband was pretty close,” Kennedy said. Repeated efforts to get answers to her problems haven’t yet worked, Kennedy said. State Rep. David Day has provided copies of state statutes on 911 addressing but it’s not clear whether the county commission, the fire district, or some other agency has to actually enforce the rules requiring proper addresses on homes. Part of the problem, Kennedy said, is that the chief of the Dixon Rural Fire Protection District is still on record as an owner of the property, though he no longer is in the home. Kennedy lives at an address on Chameleon Drive that’s only one digit different from the neighbor. According to Kennedy, the Dixon fire chief came to the home where he previously lived and removed a numeral from the home address, but either the current resident of the home or someone else has since replaced the numeral so the two homes now have the same address again, causing confusion for people who try to find either Kennedy’s home or the neighbor’s home. “Right now for the third time that 8 has been covered up by a hard number 9. As of now it shows a 9,” Kennedy said. The problem has also affected the neighbor who had a medical emergency when ambulance personnel went to the wrong house on his call. “When they had to go to 90 and it was explained it was 80 for a possible overdose, that man could have died,” Kennedy said. Presiding Commissioner Don McCulloch, who previously chaired the Pulaski County 911 board, said something needs to be done to help. “For those of you who don’t know, this lady in Dixon has a problem with her address and it took the emergency services a long time to come out,” McCulloch said. “So your concern is the time it took the ambulance to get in?” asked County Clerk Diana Linnenbringer. “And also the attitude I got. (The dispatcher) kept asking what house I was in,” Kennedy said. Kennedy said she’s tried repeatedly to find someone who can answer her concerns. Kennedy said she’s tried to reach several members of the Pulaski County 911 Board including board chairman Paul Slater and Waynesville Police Chief Bob Carter. “I didn’t even get close to the police chief; (the receptionist) told me I needed to file a complaint,” Kennedy said. McCulloch, who preceded Carter as Waynesville’s police chief, didn’t like that answer and called the Waynesville Police Department to find out why Carter didn’t speak with Kennedy. “The reason Chief Carter couldn’t see you was he was in a meeting, but they are going to give you a complaint form … They have a regular standard form and they are going to assist you as much as possible,” McCulloch said. McCulloch, who is also a former Pulaski County sheriff, said he understands why deputies told Kennedy that they could not help. Eastern District Commissioner Bill Farnham, who represents the Dixon area, said something must be done to create enforceable ordinances requiring house numbers. McCulloch said Kennedy needs to take up the matter with the 911 board. McCulloch had Linnenbringer provided Kennedy with a list of names of all the 911 board members so she could contact them as well. Kennedy said she’s not been able to obtain key information about why the ambulance was delayed in reaching her home for emergency calls. That’s not correct, McCulloch said. Later in the meeting, McCulloch reached Carter by telephone and said that while he didn’t want to intrude in the 911 Board’s business, something must be done. Western District Commissioner Ricky Zweerink said he doesn’t understand why the problem has been running since July, and why repeated efforts by Kennedy since an October meeting with the commission haven’t borne fruit. “My question is why are they having such a problem straightening this out?” Zweerink said. McCulloch said he believes the root of the problem is likely miscommunication.